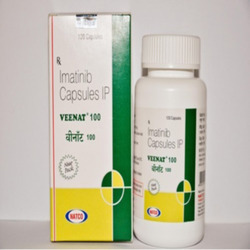 Leading Exporter of imatinib 100 mg capsules from New Delhi. We are recognized in the industry by offering an optimum quality Imatinib 100 mg Capsules. Our Imatinib medicines are used for the treatment of CML patients Leukiama. Our vendor’s experts process these Imatinib medicines in accordance with the set medical standards using top quality ingredients. These Imatinib medicines are test in terms of quality so as to dispatch effectiveness range.